At Wheaton, we are fortunate to work with bright students who are passionate about their interests—and those who come to us are ready to be challenged! Because your student likely held a leadership role or participated in activities before they arrived here, we take pride in offering a variety of stimulating ways for students to continue this engagement both in and outside the classroom. In fact, according to data we collect through the National Survey on Student Engagement (NSSE), in the last two years close to 70 percent of Wheaton seniors reported having held a leadership position in a club or organization on campus. While we are proud of the benefits this high level of student participation brings to our community, there’s another benefit that is often overlooked: student learning. With close to 100 student organizations and myriad ways to get involved in departments and programs serving our residential community, there is no doubt that substantial learning happens through these deliberately developed opportunities. This experiential learning not only advances our students in their communities and professions—but advances them as individuals as well. Our students sense of self . . . and the world! Our emphasis at Wheaton is to connect seamlessly in and out of class experiences so that we develop our students as whole persons. Essential to this is that our students develop skills necessary to be active and engaged citizens of the world. For many of our students that developmental journey begins when they arrive at Wheaton; for others, that journey continues here. Regardless of students’ previous experiences, what we teach gives students the opportunity to learn about themselves as people: their interests, their strengths and weaknesses, and how they might develop leadership skills by focusing on their passions. Combine those experiences with the way our close-knit community allows students of all backgrounds to engage with each other and we end up with an important result: students who have clarified what’s important to them, connected with others around them; and ready to lead change on campus, in the community, and likely one day around the globe. We start with the basics: we teach students how to run meetings, create and implement programs, and how to manage budgets. Through these experiences we then can develop students’ abilities in problem solving, project planning, communication and conflict resolution. We afford many the chance to learn how to advocate for their passion and recruit other students to their cause by creating an organization and requesting funding for the idea. The bottom line: students come to know themselves and their peers who come from across the country and around the world. This helps all of our students to develop the skills that will allow them to enter the world prepared to lead locally and globally! Our students lead the way . . . guided by experts! The Gallup Organization recently published a study of mid-career professionals and college experiences that helped them thrive in their work and personal lives. 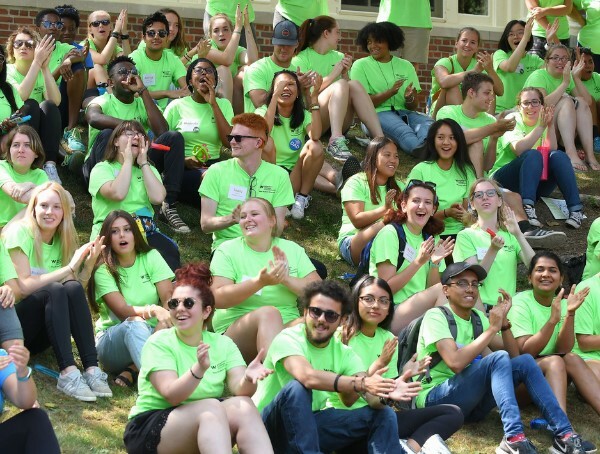 While they arrived at six factors—all offered in abundance through the programs at Wheaton —we take particular pride in the omnipresent opportunities our students have to work closely with faculty and staff on long-term projects. It is common for faculty and staff members to become mentors, encouraging students to pursue their hopes and dreams. As a result, we know that our students not only thrive while they’re here, but also later in life. Some of the programs students can participate in include leadership training opportunities with nationally known speakers and trainers. They can engage in cohort-based leadership development programs, such as the Global Leadership Development program, the Weiss Women Leadership and the first year leadership institute. There are a few half-credit classes that teach leadership theories, models and perspectives each semester. Combined, our students have so many opportunities to learn to lead, with the constant support of mentors interested in their total development. Our students are liberal arts centered and “career ready” . . . and ready to change the world! Those of us who work at Wheaton take great pride in the strong community we develop along with our students. We have been trained to understand the developmental needs of our students and to provide those “soft skills” that make them “career ready”—able to deftly handle the situations they’ll encounter in life after they receive their degree. We create dynamic living and learning communities that allow students to grow and develop, often in remarkable ways. Our mission is to provide a transformational experience rooted in Wheaton’s liberal arts mission. We believe that being engaged in campus life is an integral part of the Wheaton Edge. The distinctive and intentional out of class experiences we design, provide our students with an advantage for the world beyond campus. These dynamic and sometimes intense experiences are effective in cultivating the sustaining, broadly germane skills needed for the workplace of tomorrow. The Wheaton motto states: “That they may have life and may have it abundantly.” To us, fostering our students’ sense of who they are as leaders, and how they can go about using their passion to influence positive change in the world and learning the skills to do it, is what living abundantly means!